Let's discuss cross-coin price correlation. It is an overlooked market indicator so it's worth a thread. You should be familiar with crypto twitter's correlation measurement which consists of a screenshot of @CoinMarketCap's 7-day price spark line. It's time we put an end to this savagery. Enter cross-coin correlation. It measures the degree to which a set of coins move in tandem with each other. As correlation approaches 1, fluctuations in the combined value of the set become indistinguishable from fluctuations in any one of its underlying coins. You calculate CCC by averaging the correlation for every coin pair in a set. The benefit of using CCC is that it provides a clean line that describes how markets have behaved in over time. 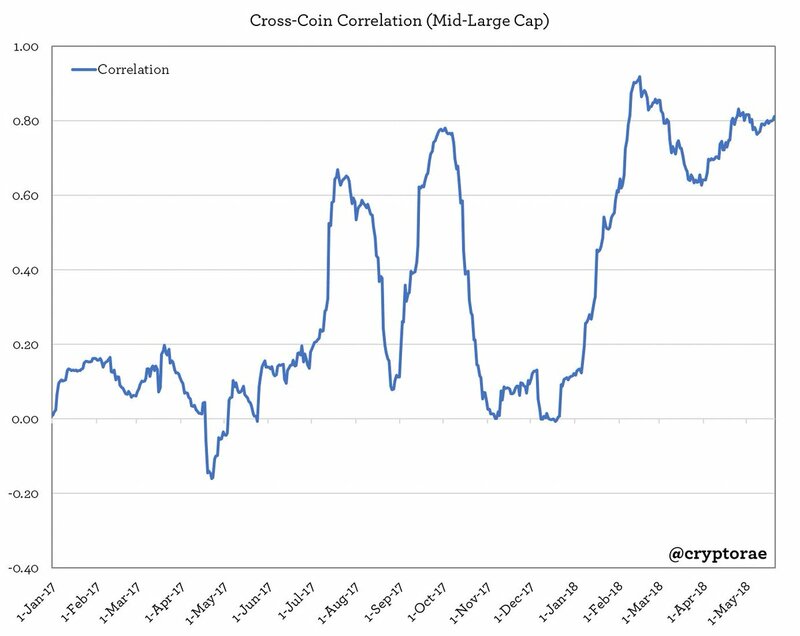 Here's the cross-correlation for 25 mid-to-large cap coins (30D rolling, realized). 1. "Crypto coins are highly correlated." Kind of true, but look at the market as recently as Nov 2017.. 0 correlation! 2. Correlations are currently ridiculously high at 0.81 and have been persistently high since early Feb 2018. It seems unhealthy/unsustainable. Realized cross-coin correlation *is not a predictive indicator*. That said, it helps build an intuitive framework that helps us develop expectations for future market behavior. Increasing/high correlations indicate that macro factors like fear or exuberance are taking a front seat in driving markets. Spikes in correlation provide decent buy/sell signals during peak fear/exuberance. I marked peak/trough realized correlations in this chart to illustrate. Strategically, in increasing/high correlation environments, I prefer having a highly concentrated portfolio. If you're looking to diversify your portfolio, do so with cash as it's the only truly uncorrelated asset. Seriously. Do you trust "diversification" at times like this? That said, I'm not dogmatic about correlations. If you have an informational or sourcing edge then, by all means, expand your portfolio. Note: reading whitepapers and following Telegram channels does not give you an edge! Strategically, in falling/low correlation environments, I put on my coin picker's hat and am happy to trade shitcoins galore. During these times you will see a higher return to trading technicals on coins with fundamental catalysts. November 2017 was coin picker's heaven. Let's throw volatility into the mix for some context. As a rule of thumb, when cross-correlation goes up, so should vol. The same applies to when correlation falls. The relationship is imperfect and decouplings of the two do occur, which is where things get interesting. One type of decoupling is when volatility rises and cross-correlation falls, or is already low. 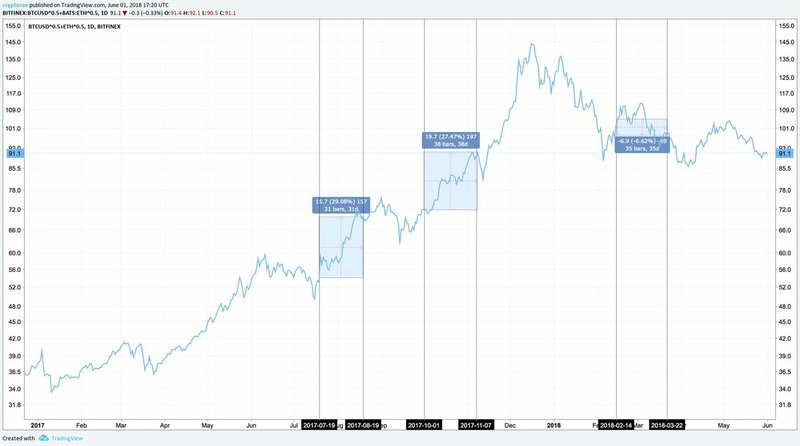 These periods mark a special time for us all: "alt season". Traders with a strong grasp of risk management stand to make outsized gains during these periods. If you'd like proof of this, see @BMBernstein's excellent alts thread for an illustration of start/stop dates for alt seasons and compare those dates with the decouplings in the corr/vol chart. The dates line up. The other type of decoupling is when volatility falls and cross-correlation rises, or is already high. Markets have been in this mode since March 2018. The implications of this is harder to interpret.. the markets are in a really weird place right now. 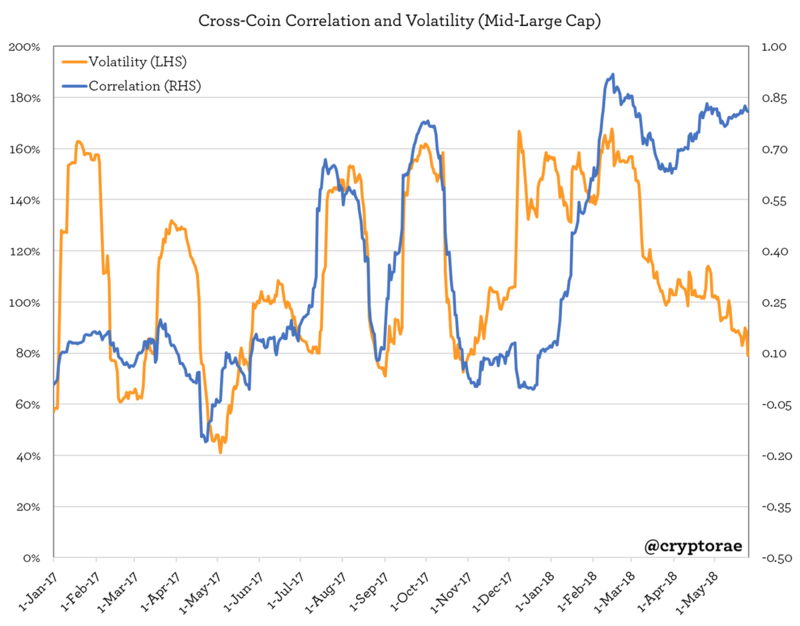 Crypto correlations tend not to stay this abnormally high and volatility this abnormally low. I've been thinking over and over about this question: through what path do we expect correlations to unwind and volatility to rise? Which scenario do you find the most plausible for when cross-correlations fall? #1 seems most plausible because I *feel* BTC dominance is near historic lows and needs to rise first before altcoins pump. #3 is plausible if you believe new projects like EOS are going to further diminish Bitcoin's role in the market. #4 unlikely b/c of #1. #2 seems implausible. If you have a different interpretation of the corr/vol decoupling or of the goofy markets as of late, hit me up in the replies or through DM (currently open). I also welcome questions and feedback.